Beet and Goat Cheese Salad with Blood Orange Oil - A recipe from Savor California, the online showcase for extraordinary gourmet foods and beverages from California. Suggested by Peggy Knickerbocker, author of the cookbook "Olive Oil from Tree to Table." Boil or roast the beets. Peel and allow to cool. 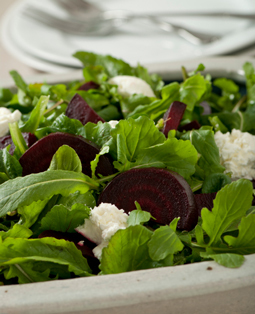 Top arugula with beets and fresh goat cheese. Drizzle with Stella Cadente Blood Orange Oil.